LLC owners enjoy limited liability, meaning that creditors of the LLC cannot seek satisfaction of their claims out of the personal assets of LLC owners; they may only seize assets that belong to the LLC itself. If an LLC owner personally guarantees an LLC debt, however, creditors may seize the guarantor's personal assets in the event that LLC assets prove insufficient to fully repay the debt. 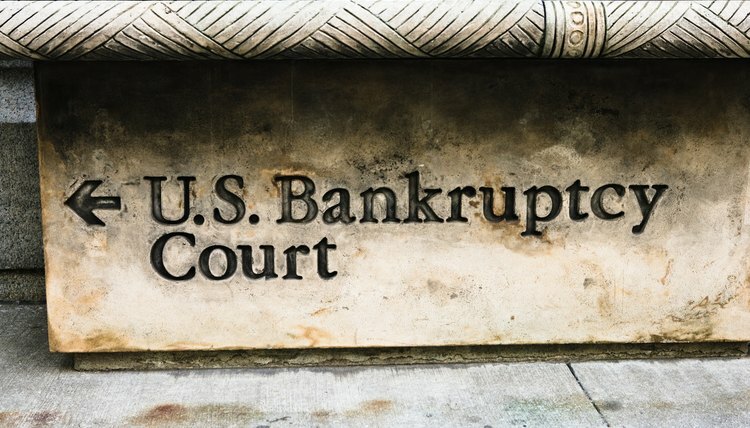 Under a Chapter 7 bankruptcy, the court issues an automatic stay of collection activities against the LLC by creditors, appoints a bankruptcy trustee to seize LLC assets, liquidates LLC assets, and uses liquidation proceeds to satisfy creditors. Under Chapter 7, LLC assets are generally insufficient to fully repay LLC debts; instead, each creditor must settle for a percentage of the total debts owed. No discharge of debt is available; instead, the LLC is simply dissolved. An LLC is eligible for Chapter 11 bankruptcy if the bankruptcy court is convinced that it has the ability to repay its debts over time. Under a Chapter 11 bankruptcy, the LLC's assets are not liquidated and its business continues in operation. It negotiates a debt repayment plan with a creditor's committee composed of its seven largest unsecured creditors, and submits the plan to the bankruptcy court for approval. The repayment plan generally grants extended repayment periods, and may waive a portion of the interest due on outstanding debt. The bankruptcy court supervises repayment and may require the LLC to engage in business reorganization to ensure its ability to meet its obligations. The term of repayment normally does not exceed five years. During the term of repayment, the court issues an automatic stay of all debt collection activity against the LLC. After the LLC completes repayment, it is discharged of all remaining debt that arose before the court accepted its bankruptcy petition. When a court "pierces the corporate veil," it declares a company's limited liability status a sham and permits creditors to reach the personal assets of the company's owners. Piercing the corporate veil applies to LLCs as well as corporations. A court may strip an LLC of limited liability status for a number of reasons, including fraud, insufficient capitalization, and the commingling of owners' personal assets with LLC assets. A one-man LLC may face particular scrutiny from a court, since there are no other members to prevent the owner from treating LLC assets as his personal assets. Limited liability companies have certain advantages, such as allowing owners to enjoy liability protection similar to a corporation while being taxed like a partnership, thus avoiding double taxation. But an LLC also has disadvantages, such as when one member, or owner, becomes insolvent and has to declare bankruptcy. Even if there are only two members in an LLC, one member becoming insolvent doesn't necessarily mean that the LLC has to dissolve, but it can cause problems. Because an LLC is an independent legal entity formed under state laws, those laws dictate what follows.